Double jacketed made out of 18/16 swg. 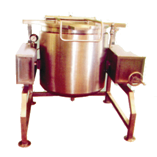 Stainless steel, mounted on SS stand with SS side supporters and tilting handles.Capacity: 15, 25, 50, 100 and 200 Ltrs. The company was established almost two decades ago, in 1988 by Late Shri. M.S. Satyanarayana, who possesses 30 years of experience in design, manufacture, supply, erection and commissioning of commercial kitchen equipment such as steam equipments, gas equipment and electrical equipments. Right from the beginning, the customers of high repute for whom cost was never an issue opted for our manufactured products. The company provides unmatched quality products to its valued customers. As a result, many of our customers have patronized us for all their requirements of kitchen equipments. Rajalakshmi has been making unremitting efforts in terms of quality so that a better product is dispatched in the market. We are using only 304-quality stainless steel. Inspite of stiff competition, we ensure that customer get the finest quality products at competitive prices. Our Company was established about 25 years ago. The team possess vast experience in Designing and manufacturing of Kitchen equipments like Steam, Electrical, Gas, Washing, Storage, Refrigeration and Service Equipments. We have been producing quality products. Hence, we have esteemed clients who was patronizing us for all their commercial kitchen equipment requirements. We are making continuous efforts in maintaining the quality and upgrading the factory with modern CNC machines so that quality products can be given to the customers. The SS used is of food grade with good finishing at competitive prices.